After the skiing at Gangwon-do, we went back to Seoul hoping to celebrate Christmas in a noisier setting. But first, we went to this dog cafe in Myeongdong. Dogs were everywhere in the cafe, roaming about. We had to pay an entrance fee of about SGD 8-9. And it includes a drink u can choose from the menu. As usual, I ordered my caramel drink. Look at this dog sleeping in the heaps of down jackets! comfy sia! I plucked up enough courage to carry this dog, which Anqi and Nic says is the most obedient dog of the lot. Ok. I got abit scared and made the dog shiver while I was holding it. LOL. Come to think of it, ain't he/she cute? Next morning was 26th Dec. Boxing day! Haha so we went to this apparently largest church in the world. There are 2 other churches who claim to be the largest. So...unless u have been to all 3, u would never know which one is REALLY the biggest. After some walking from the subway station, we finally reached the Yoido Full Gospel Church! Looks oldie from the outside, with the traditionally bricks and all. They were having their service in korean. with a big choir singing some songs. We stayed on awhile to hear the pastor preach in KOREAN. LOL. didn't understand a word, but I wanted to hear the choir sing. The hall was really big but I couldn't capture it due to the corner I was standing at. Yes standing. Alot of ppl were standing because there wasn't enough space! Well after awhile we left. Looks awesome from this picture. 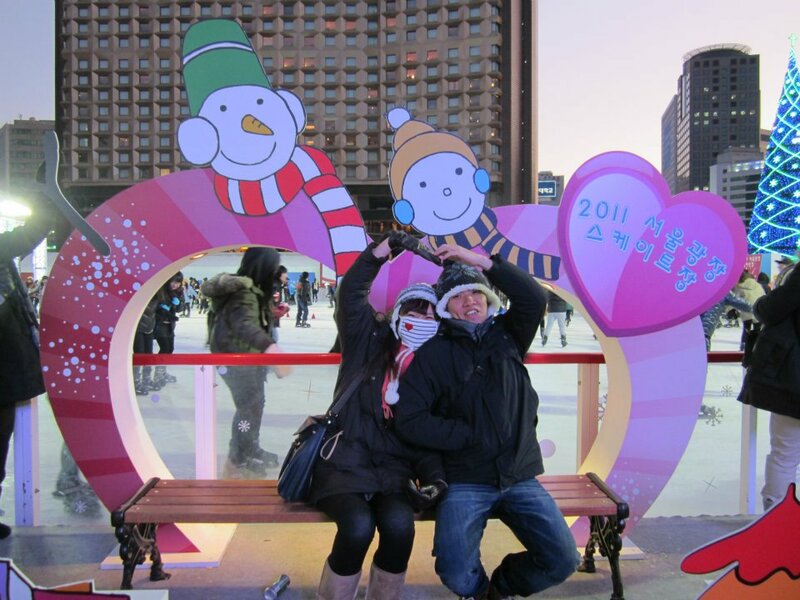 Then we went to the central area of Seoul to look at this outdoor skating rink! Can u imagine that its so cold that a skating rink could just be put outside. Likewise, due to the weather being so cold, I wore my trustee mask, and jumped at the opportunity to go near any heater to warm myself up. Don't know who suggested but we decided to do a Love pattern for the photo. LOL. Next day, Mabel and Michelle left for their trip to China. Leaving me, LL, and Anqi. This was our lunch at a restaurant with GREAT BEEF! Hee....always wanted a VW wallet. We checked out from the motel and somehow we met up with Kuan Liang and Isaac, who came back respectively from their own travels with the girlfriend and friends in Japan. HMPH. Had booked this place, but we realised that the room was so small there wasn't even room for our luggage, so we decided to book somewhere else and ended up at this place called David Hotel. More pricey but the service was sooooooo good. And it isn't sleazy or what like other motels. So if u think normal hotels are too ex u can go for this motel too! Later in the evening, KL met up with his dad's business partner's son. And he actually brought us to this atas place for dinner. Did some shopping along the shopping malls and we ended the day for some real fun the next day!